Looking for the perfect career for your daughter (or even a career change for you)? Read five reasons why engineering may just be the answer. Engineering might not instantly evoke the same exciting appeal of professions such as law or medicine, but it’s about time that we start to appreciate just how attractive a career in engineering can be for women. Right now, there are more female engineers than ever before. But despite this, women still only make up 6% of the UK industry. This means that the field is missing out on curious and brilliant female minds to help solve solutions that affect our daily lives and futures – minds like those of your daughter (and possibly even you!). To help persuade you that engineering may just be the perfect career for your daughter – and even you if you fancy retraining – experienced mechanical engineer and technical consultant Janine Hayleigh shares five reasons why engineering is a fantastic professional for a woman. After all, the more women we educate about the opportunities that exist for us in the industry, the closer we’ll get to gender equality in engineering. If your daughter enjoys applying maths and science to solve problems that help to sustain or change our world, then engineering is an ideal career choice. However, there are so many fields within engineering, all requiring different specialisms and call on a variety of soil sets, that are equally pivotal in any project. For example, the design, construction and maintenance of an aeroplane uses the expertise of mechatronics engineers, mechanical engineers, mining engineers, chemical engineers and electrical and software engineers. So your daughter can choose to study whatever area appeals to her the most, and still expect to be at the top of her game. A good salary is one of the key factors in any career choice and, luckily engineering offers a great one. Starting salaries start between £20k and £25k and this can lead to anywhere between £25k and £40k after just a few years of experience. There’s also the potential to work overseas and you can even choose to be self-employed as a consultant. Knowing that your kids have a secure future is a mum’s biggest worry, so a career choice with such high rewards and room for progression will help to put your mind at rest. Just like a doctor is needed to save lives, and a lawyer is necessary to bring justice, an engineer is pivotal in making the everyday things work better for everybody. There’s nothing stopping you from being part of more ambitious projects too. Engineering is an opportunity to be part of man-made phenomena such as Dubai’s Palm Islands, China’s energy efficient National Stadium and Europe’s Channel Tunnel. Problems are an engineer’s inspiration and motivation, so seamless solar power systems, robots, hovercrafts and buildings that overlook space, might be closer to being in existence than you think thanks to women. Tell your daughter that she could be building hovercrafts and you’ll surely grab her full attention and spark her imagination. The women who do work in engineering today are so proud that they have started to celebrate with National Women in Engineering Day. Female engineers are fantastic role models (if you know any, have a chat with them and ask them to answer any of your or your daughter’s questions). It’s a career to feel proud of, and many of us do, especially as a woman in a male dominated field. Emily Roebling successfully took over her husband’s role as Technical Leader of the Brooklyn Bridge. Film star Hedy Lamarr invented a remote-controlled communications system for the American Army in WW2. Mary Anderson invented the simple but essential windscreen wiper. There’s no reason why you or your daughter shouldn’t join these women on a list of top female engineers. Being an engineer is being a part of the present, future and maybe even history. 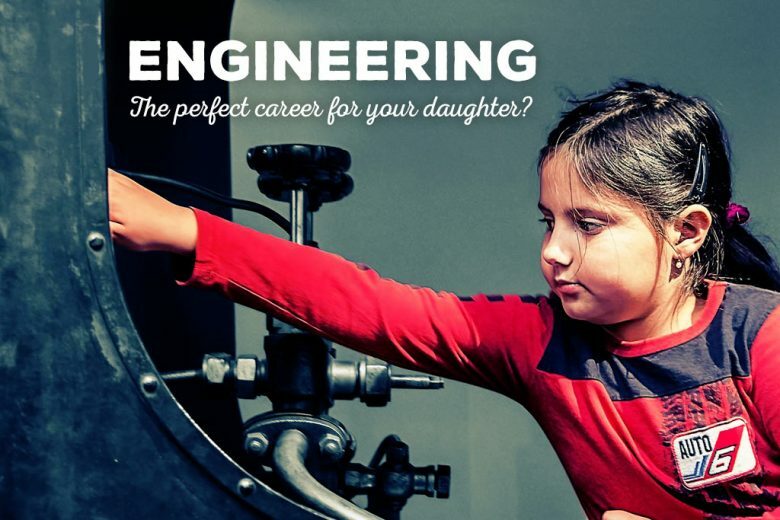 With plenty of options of where to apply engineering skills, there is much excitement to be had when discussing it as a potential career with your daughter. And if you fancy looking into it as a career for yourself, remember that it’s never too late – speaking as one of the 6%, we’d love to have you on board! Janine Hayleigh is an experienced mechanical engineer and technical consultant. She also works to promote gender equality in the field.